Camp Iron Horse is designed to offer fun and educational activities for children that excite the mind, body and spirit, teach knowledge and skills, build character and self-awareness, and promote cooperation. Our counselors are responsible, caring and highly qualified. All are trained in First Aid and CPR. You may email or call Outdoor Pursuits at 406-863-3006 to enroll in any of the camp activities. You can also stop by Fish Camp Lodge to enroll in person. Each camper must have a completed current enrollment form on file before they can participate in camp activities. Enrollment forms are always on hand at parent drop-off. Please allow time prior to the first activity your camper is enrolled in to fill out an enrollment form. To provide the best experience possible each day, space is limited depending on the scheduled activities for that day. Enroll early to ensure a spot for your child. All campers must be at least 4 years of age. Due to vendor policy and/or a level of maturity needed to enjoy the activity, age limitations are essential to the overall success of the day. Additional age requirements are noted in the calendar and activity descriptions. My name is Rebecca Fredenberg and I am the Activities Coordinator. Like many of you, the mountains and wild rivers called and I am happy to call this place home. With my background as an EMT, adventurer, and professional nanny, I have combined this love of kids, safety and exploration toward another fun and rewarding camp season. Please take the time to view our 2019 Camp Calendar and you will see some of Camp’s tried and true favorites such as: Watersports, Whitewater Rafting, Waterslides, Rock Climbing, Laser Tag, and Horseback Riding. You will also see some new activities added to the mix such as: Discover Scuba, Dance Grooves, Xtreme Ninja Gymnastics, Pickleball, and our Stanton Lake Hike. 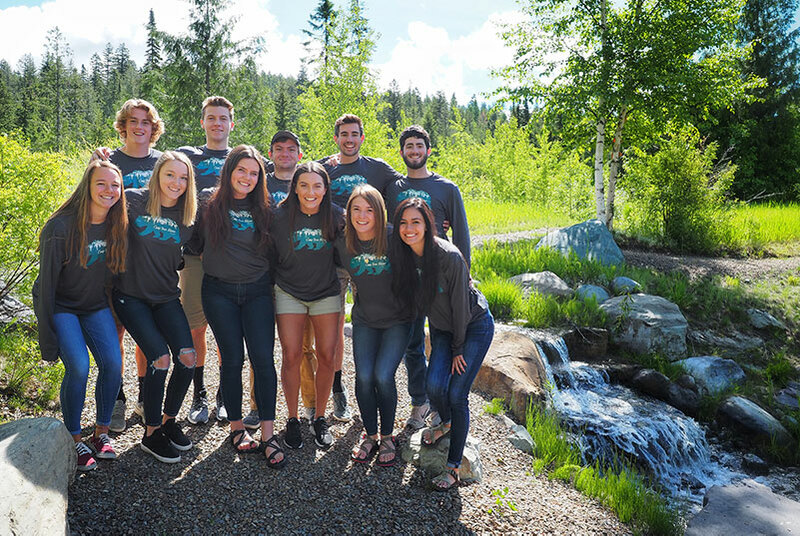 We have quite a few returning camp counselors this summer and several new faces who are excited to bring their energy and friendships to camp. Summer is almost here and we looking forward to seeing you all soon! Take care! *Although the information above is a reflection of the majority of the activities, it is NOT accurate for ALL activity rates. Please call Outdoor Pursuits for specific activity descriptions and information. The Amazing Fun Center – A popular outdoor center hosting many activities such as miniature golf, bumper boats, go-carts, and the Glacier Maze! Wear or bring swimsuit as the bumper boats certainly will get your clothes SOAKED. Get ready to tie those aprons! With the instruction of our very own Chef Jake Roberton, these mini-chefs will learn how to prepare brunch for their families. Campers will then serve and dine with their families, enjoying the meals they have masterfully created. Drop-off at the Clubhouse, followed by an earlier end of camp at 12:30pm. Fish Hatchery – Curious about Montana fish? Spend the day learning about the beautiful local trout, enjoy a nature walk, and partake in several hands-on art, music, and craft activities the Creston Fish Hatchery. This event is hosted by the U.S. Fish and Wildlife Service and all ages are welcome. Frisbee Golf & Waterpark – Spend the day throwing discs on a professional Frisbee Golf Course and cooling off at Woodland Waterpark’s lazy river and waterslides. Hike- Finger Lake – A beautiful and serene lake located in the Lebeau State Forest just north of Whitefish. The hike is 4 miles round-trip so please be prepared for walking the entire trek. Bring swim attire for a rewarding dip. Hike – Stanton Lake– This hike is perfect for all ages, and is 4.3 miles round-trip. Located in the Flathead National Forest, this moderately trafficked trail ends at a breathtaking lake. Campers will enjoy having lunch, skipping rocks, and experiencing nature while swimming in a backcountry lake. Horseback Ride – Join the wranglers at Swan Mountain Outfitters for a scenic trail ride near West Glacier. Along with the trail ride (7+ years), or corral ride (4-6 years), campers will also get to enjoy The Crown of the Continent Learning Center, which houses many Montana ranch animals that would love to be petted. Closed toed shoes and long pants are required. Intro to Scuba Diving – Have you ever wondered what it’s like to breathe underwater? If you want to try scuba diving, but aren’t quite ready to take the plunge into a certification course, dive into this experience. This PADI certified facility will privately introduce the scuba basics on a controlled pool environment. Campers must be at least 10 years of age. Cost for this activity is $100 per person. Junior Tennis Camp, Day 1 & 2 – Enjoy just one or both days of tennis instruction from Tim Brueggeman. This camp is designed for all abilities, beginner through advance. Whether you want to improve your forehand, backhand, serves, volleys, or simply want to learn how to play tennis, there are plenty of rewards on the court. Mountain Biking – Whether your bike has never seen a dirt path or that’s the only way you ride, come join Camp Iron Horse for the day. You will ride with a qualified mountain bike instructor gathering tips and tricks as well as experiencing and exploring local mountain bike terrain. Bring your swimwear too as you will get to bike out to a small serene lake where paddle boards will be ready for you to hop on. Space is limited so sign-up early. Camp rate does NOT include bike rental. If you are in need of a bike rental please let us know when you sign-up. No previous experience is required. **Novice and Expert riders are welcome as the group is divided by ability. ** Campers must be at least 8 years of age and closed toed shoes are required. Rock Climbing – Ready for a rewarding challenge? Alongside a knowledgeable and trusted guide you will learn how to safely defy gravity by climbing up steep rock faces. All climbing and safety gear is provided. No previous rock climbing experience is necessary. Campers must be at least 7 years of age to participate and closed toed shoes are required. Science in Glacier National Park – Spend the day doing hands-on experiments in the great outdoors. You will be exploring under the instruction of teachers at Glacier Institute at the Big Creek Campus located in the wild and scenic North Fork area of the Flathead River adjacent to Glacier National Park. Please call Outdoor Pursuits to learn more about what the day’s focus will be. Sport Triangular – The Sport Triangular is a 3 sport competitive day consisting of Golf and Tennis followed by cooling off in the pool with structured Pool Games. Each participant will get a chance to compete against their peers under the supervision and guidance of Iron Horse professionals. Players will need to bring their own golf clubs (If their clubs are stored at the cart barn then we can transport them to and from the pool). All other equipment will be provided. Campers must be at least 8 years of age. Drop-off and Pick-up at the Larkspur Pool. Waterslides – Is the summer heat getting to you? Cool off by zipping down one of the ten slides at Big Sky Water Park, hangout in the large whirlpool, join a game of beach volleyball, or play a quick round of miniature golf. Whitewater Rafting – Feel the rush and adventure as we hit the Middle Fork’s class II-III rapids with Glacier Rafting Co.
Age restrictions apply depending upon water levels. Shoes with a back strap are required, otherwise rental shoes of $3 is required. Water Sports on Whitefish Lake for Campers Ages 4 to 8 on Mondays and Ages 9+ on Tuesdays – Jump on the boat and join the Iron Horse Marina staff for a fun time wake surfing and tubing around Whitefish Lake! Art Studio – Get creative at Stumptown Art Studio while having fun painting pottery, or working on mixed media art…something all ages can enjoy. Bingo Pizza Party – Enjoy a night filled with games, pizza, and prizes. Bowling – Strike or gutter…you will be sure to laugh at the bowling alley. Dance Grooves – Join the professionals at Dream Dancers for some private dance lessons on Hip Hop, Jazz, and Tumble. All ages are welcome to learn some sweet dance moves, so get ready for a fun night! Dodgeball – Standard Dodgeball is a team-oriented game where two competing teams try to outlast the other by “dodging” the balls thrown by the other team. After a few rounds campers will then play All-Ball and other variations of Dodgeball or any other sport that the crew wishes to play. Indoor Rock Bouldering Gym – Looking to refine your Spiderman skills? A guide will teach campers how to scale climbing walls, some up to 14 feet high. This climbing gym has something for all abilities and ages including a small kid boulder with a slide. This gym is specifically for bouldering and includes a nine inch pad floor, so no roped climbs for this place. Intro to Hockey & Ice Skating – “You miss 100% of the shots you don’t take.” – Wayne Gretzky – Join us for a fun private event for boys and girls (no experience needed) learning the skills to skate, pass, shoot, and maintain puck control. Cool off in the middle of summer by skimming along smooth ice! Be sure to bring layers (gloves, hat, long-sleeved jacket, and pants). Helmets are STRONGLY suggested, however they are not available to rent. We encourage campers to bring their ski or bike helmet to wear while skating. Pickleball – Join Tim Brueggeman, our Tennis Pro, as he teaches the fun elements of this sport. Pickleball is a paddle sport that combines elements of badminton, tennis, and table tennis, and is sure to be a fun time on the courts. Movie Night – With all our camp activities, sometimes it’s good to relax and enjoy a new-release (PG or G) movie. So sit back and enjoy a theatre film with some good ol’ popcorn. Laser Tag – Similar to Paintball but this game of strategy comes without the pain of getting hit. The laser tag game is located on a partially wooded field and campers will be lead through differing games like capture-the-flag and last-man-standing. Please wear closed-toe athletic shoes, a long sleeve shirt and long pants. Campers must be at least 7 years of age. Xtreme Ninja Gymnastics – Campers of all ages will get to hone their ninja and gymnastics skills with private instruction from Flathead Gymnastics. Fish Camp 3rd of July BBQ (Time: noon-3 pm)-A fun family event located at Fish Camp. Kids will enjoy multiple competitive events including: The fishing derby and the limbo contest. Of course the day would not be complete without youth and adult divisions of Iron Horse’s own rendition of a pie-eating contest. 4th of July Carnival -After the Club BBQ bring the family over to the carnival on the event lawn. Carnival games, inflatable bounce-houses, a face-paint booth and carnival food are provided to help the time go by before fireworks light up the sky. End of Camp Western BBQ – Join us on August 11th at the Iron Horse Clubhouse for a night of family fun! The theme of this Western BBQ spans from a delicious BBQ style buffet to live music by the Levi Blom Band! The band has traveled Montana and the country with superstars such as Joe Nichols and John King. They will perform a mix of original songs they have written and cover some of today’s most popular country songs. Counselors will be on hand and dancing is encouraged…this event is not to be missed!